Taoiseach Leo Varadkar has said the Brexit deal between the European Union and the UK, which was announced in Brussels, has achieved "what we sought to achieve". He said the joint commitment by the EU and Britain to the retention of a free-flowing border between Ireland and the UK post-Brexit is "rock solid and cast iron". Mr Varadkar described assurances outlined in the agreed text as "politically bulletproof". "We have protected what we sought to protect and we achieved what we sought to achieve," he said. Speaking on RTÉ's Six One, Mr Varadkar said it is an agreement with not just Ireland, but Europe. He said Phase 1 was about narrowing parameters and after what has been agreed, he said he believes the next stage is leading Britain towards alignment. On the issue of alignment, he also said that any obstacles this may create for the UK in forging new trade relationships was their difficulty to deal with and not Ireland's. The European Commission has said enough progress had been made in Brexit negotiations with Britain and that a second phase of negotiations should begin. Mr Juncker said: "I will always be sad about this development, but now we must start looking to the future, a future in which the UK will remain a close friend and ally." Mrs May said the deal agreed is a significant improvement from Monday, and the joint report is in the best interests of the whole of the UK. She said that "we guarantee there will be no hard border in Ireland" and "we will uphold the Belfast Agreement". Mrs May said that she spoke with Mr Varadkar on Friday and they agreed there will be no barriers to trade north-south or east-west. She also said that the agreement would guarantee the rights of three million EU citizens in the UK "enshrined in UK law and enforced by British courts", and that it included a financial settlement which was "fair to the British taxpayer"
The text of Britain's Brexit agreement says on the border that the UK "will maintain full alignment" with the EU single market, customs rules that support peace, cooperation, economy of island of Ireland. Reacting to the breakthrough at Government Buildings in Dublin, Mr Varadkar downplayed changes in the wording of the text from Monday's ill-fated draft, which was scuppered by the DUP. He said the amendments were "stylistic changes in language" or "just statements of fact" that his Government had "no difficulty with". The Taoiseach acknowledged relations between the UK and Ireland had become strained during the Phase 1 negotiations, but he predicted that now his Government has achieved the desired guarantees on the border it would become one of London's "closest friends" in the next stage of the Brexit talks. The commission's recommendation that sufficient progress has been made will now go to the European Union summit of leaders taking place next week. Mrs May said she expected a formal agreement to be approved at the summit. "Prime Minister May has assured me that it has the backing of the UK government. On that basis, I believe we have now made the breakthrough we need. Today's result is of course a compromise," Mr Juncker told a hastily arranged news conference. The commission said it was ready to begin work immediately on Phase 2 talks, which cover trade and long-term relations with the bloc. European Council President Donald Tusk said the EU is ready to start negotiating a transition period with the UK and wanted more clarity on how it sees their new relationship after leaving. He said Britain will have to respect all EU laws during the transition, as well as as respect its budgetary commitments and the bloc's judicial oversight. But it would no longer take part in decision-making that will be done by the 27 remaining states. Mr Tusk said, however, too much time was spent on negotiating the outlines of Britain's exit, which he said was the relatively easier part. "We all know that breaking up is hard but breaking up and building a new relation is much harder," he said. "So much time has been devoted to the easier task and now ... we have de facto less than a year," left of talks before Britain is due to leave in March, 2019. 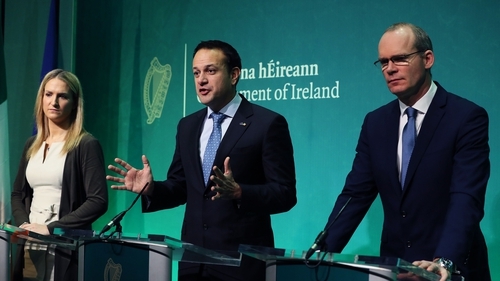 Tánaiste and Minister for Foreign Affairs Simon Coveney said the deal "fully protected" the Good Friday Agreement, the peace process and an all-Ireland economy. "What it means is any deal that is done has to be better than the default position, otherwise we won't be able to agree it"
Under the terms of the negotiations being carried out under Article 50 of the EU treaties, the European Council must agree that sufficient progress has been made on the divorce issues of citizens' rights, the Irish border and the UK's financial settlement before talks can move on to the issues of trade and transition. Mr Juncker cautioned: "The joint report is not the withdrawal agreement. That agreement needs to be drafted by the negotiators on the basis we have agreed yesterday and today and then approved by the Council and ratified by the UK Parliament and European Parliament." He said that he and Mrs May had discussed the need for a transition period following the formal date of Brexit, and shared "a joint vision of a deep and close partnership". "It is crucial for us all that we continue working closely together on issues such as trade, research, security and others"
"We will take things one step at a time, starting with next week's European Council, but today I am hopeful that we are all moving towards the second phase of these challenging negotiations and we can do this jointly on the basis of renewed trust, determination and with the perspective of a renewed friendship." Mrs May said that the negotiation process "hasn't been easy for either side". "When we met on Monday, we said a deal was within reach," said the PM. "What we have arrived at today represents a significant improvement." Democratic Unionist Party leader Arlene Foster said "substantial progress" had been made from the text her party rejected on Monday. Ms Foster, who negotiated directly with Mrs May into the early hours of Friday, said Northern Ireland would now leave the single market and customs union and insisted there would be no border down the Irish sea, dividing Northern Ireland with the rest of the UK. "There will be no so-called 'special status' for Northern Ireland as demanded by Sinn Féin"
"Northern Ireland will not be separated constitutionally, politically, economically or regulatory from the rest of the United Kingdom and the joint UK-EU report at the conclusion of Phase 1 makes clear that in all circumstances the United Kingdom will continue to ensure the same unfettered access for Northern Ireland's businesses to the whole of the UK internal market." But the DUP leader made clear there was "still more work to be done".